The ‘Heifer management in northern beef herds’ manual is also available from MLA. This publication is free to everyone. 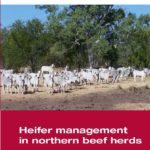 This publication is a direct outcome of MLA-funded heifer projects conducted in northern Australia – NBP.344 and NBP.345. Findings from a concurrently-run heifer project NBP.339 and research results obtained in Beef CRCII project NBP.301 have been incorporated into this publication. Although the publication has focussed primarily on heifer management in extensive beef herds, the principles have equal application to all beef herds across northern Australia despite any differences in scale of operations, breeds, climatic conditions or pastures types. Download the Heifer management in northern beef herds (PDF 1 MB).